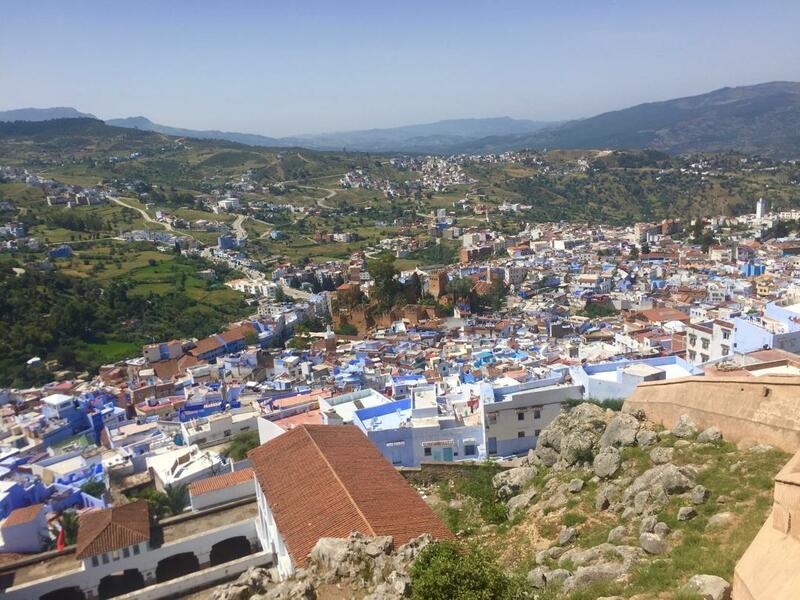 Chefchaouen is known as the Blue Pearl and the home of Moroccan Gold-Hashish. Hashish is illegal in the Kingdom of Morocco and yet the Government tolerate the cultivation of marijuana and production of hashish; the locals will tell you that it is because it is the biggest export they have. 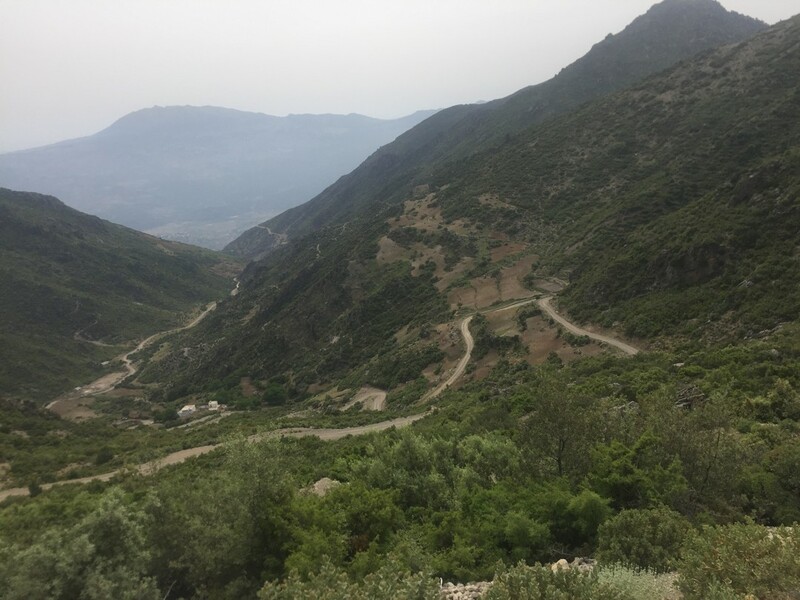 It was a long and winding road from Fez to Chefchaouen, gradually ascending the Rif Mountains which became more omnipresent as we neared the city. 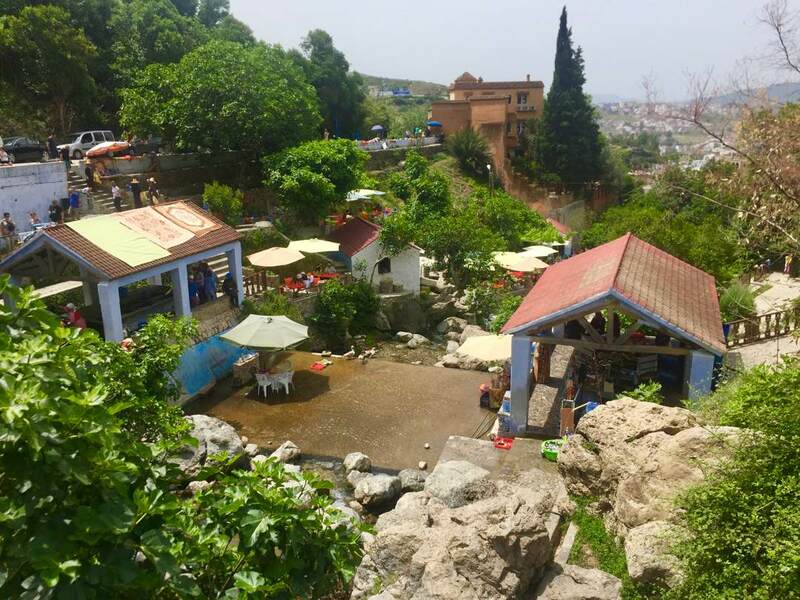 The last couple of kilometres, as Chefchaouen slowly appeared were stunning. 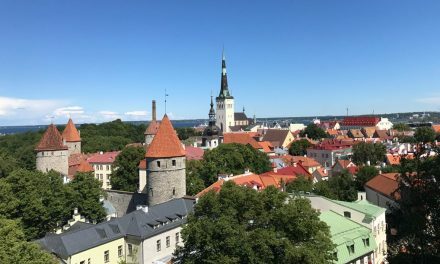 The city climbs a steep mountain range from about half to three quarters of the way up and reflects the colour of the sky against the dark green of the valley below and the rocky outcrops above. Our accomodation, “Dar Scotlandee“, is the highest accomodation in the city and affords a view from the terrace, across the valley and medina, that is quite simply, out of this world. We could see uninterrupted across the entire valley to the mountain range on the other side, a view which takes in most of the city as well as numerous villages and hamlets sprinkled throughout. At certain times of day a thick cloud bank sits above the valley so that it appears as though the top of the mountain range grows out of the clouds, while the valley and city are far below in another world. It is hard to imagine pictures doing it justice. It was a pleasure to start the day on the terrace and to escape the heat of the afternoon there too. The owners of the BnB, Terry and Suzanne are a lovely Scottish couple who have been living in Chefchaouen for 11 years with their son Liam. They provided us with invaluable advice about local sites and directions into and around the medina. Here’s an insiders tip, don’t walk straight down the stairs in the medina as it is really quite small and before you know it you will be at the bottom and out the other side, you will also miss the most gorgeous little alley ways and streets, blue from top to bottom with bright green grape vines creating shady roofs or cerise bougainvillea creeping up the walls. 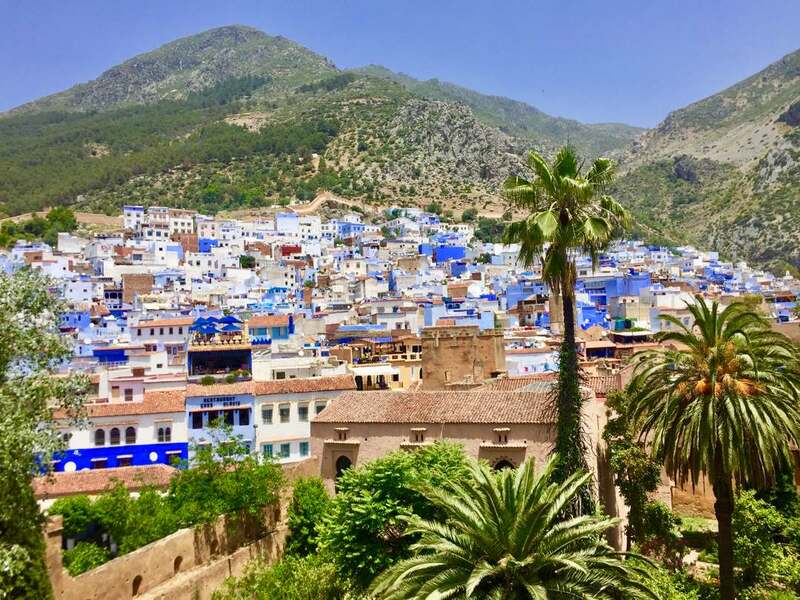 The medina, which makes up most of the city, lies within an ancient stone wall and is splashed with every imaginable shade of blue from the palest sky blue to the brightest cobalt. There are many stories and theories about why the city is painted in this way, the most convincing seems to be that the hills surrounding the city contain a blue pigment and the traditional Berber people from the mountains would bring it with them and add it to the lime wash, which they used to protect their adobe homes. And as with all Moroccan homes, the intricate and beautiful mosaic tiles are prominent features, making the whole town seem like a home decorators teaching manual. Surrounding the wall, radiating both up and down the mountains are newer homes (newer in that they are not 1000 years old), shops and other civic buildings, some in blue, many washed in maroon, yellow or brilliant white, similar to southern Spain. 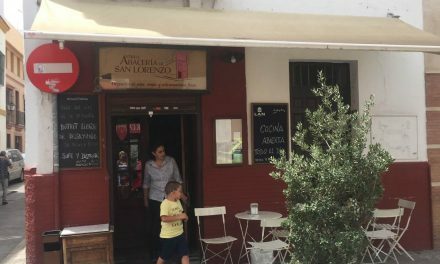 The whole area is reminiscent of the Andalucian region of Spain and as the locals tell it they are the original Spaniards. Which was an interesting connection, given that we planned to travel to the south of Spain from Tangier. We settled in quickly and were out the door and trundling along a dirt track to explore the medina. 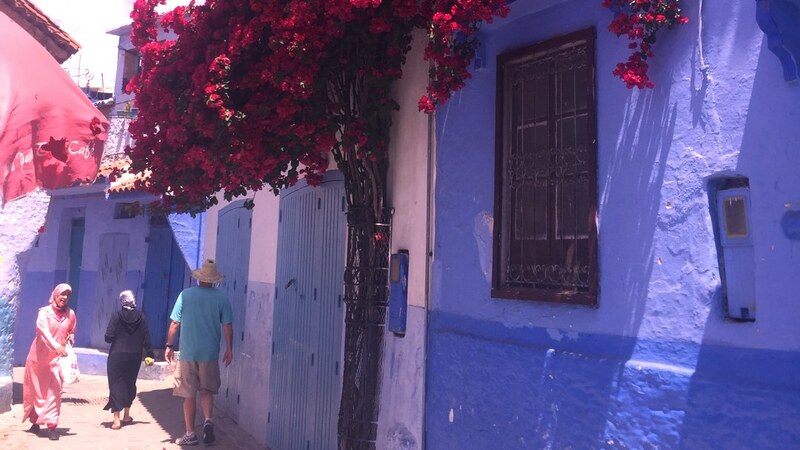 We wound our way up past half built houses, around the newly built swimming pool complex (you guessed it, it is painted blue), through a public garden and then down again to the walls of the medina. We were quite curious about the very common practice of what appeared to be half building a house. It seems that the reason for this is that people are able to access micro finance type loans, so they only build what they can afford at the time and then as they are able they add an extra room. Doesn’t that seem a very sensible approach to finance and avoiding massive debt that in a rural, agriculture area could see people financially crippled? The walls of the old city are about 12 feet high, constructed from crenelated brown adobe and punctuated at regular intervals by medieval gates. Our host Terry had suggested we approach the old Medina via the river, however as we were unable to figure this out on our first visit, we passed through the closest of the gates and were once again back in that ancient world of the Medina, but with an exceptional difference. It was quiet and relaxing! The market stalls and shops appeared sporadically at first but as we traversed the medina they became more prominent, as we headed toward the central square, as it does in Marrakech and Fez ,but joy of joys, the local traders are a much more relaxed people and rarely hassle you! In fact other than the occasional bonjour or as-salam, they seem to be happy to let you wander and take pictures, whilst they generally go about their lives. 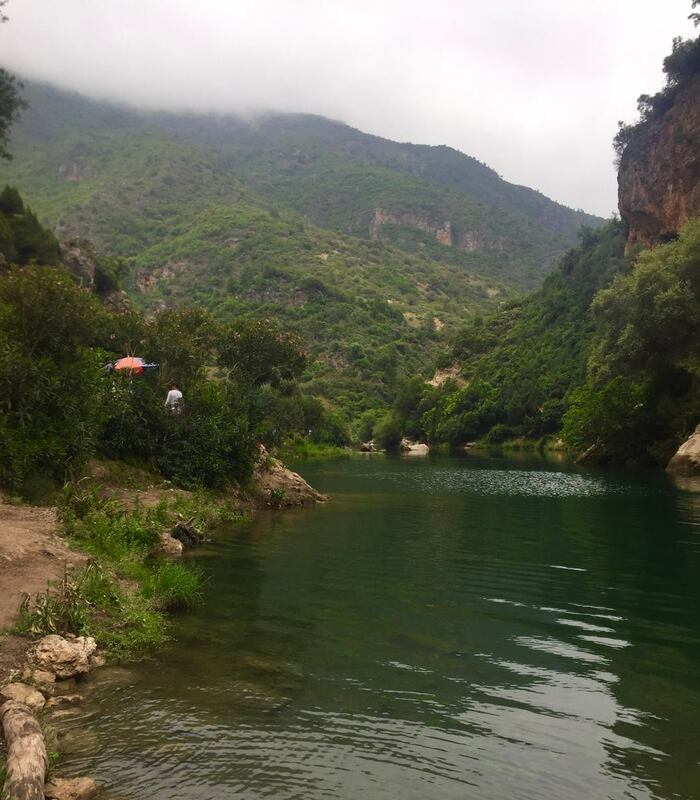 We quickly found ourselves strolling along the river that runs through the town, to the Ras el Maa waterfalls. There are many touristy shops and the traders are a little more enthusiastic but not one person offered to ‘guide’ us and contrary to common belief and travellers stories, we were not hassled to buy hashish at every turn. The mountain people are very short and quite small in stature and as we reached the bridge, we saw tiny little women carrying huge loads of washing upon their backs, as they headed to the riverside to do laundry, as they have done, well forever, we guessed. Along the riverside at this point there are many cafes, juice bars and restaurants, which Terry had warned were quite pricey and touristy, but it is worth having a juice and enjoying the shade while you people watch. And you will need to rest in the shade. Whilst it is cooler than Marrakech or Fez, it is still in the high 30C range. We followed the river down and enjoyed the stroll on through the rest of the town, but once out of the medina, the traffic becomes more hectic and the buildings more likely to be half finished, plain brick or concrete, with little uniformity. At this point we wave down a petit taxi for the trip home for 15 DHS, about $2 AUD. Again we were surprised, our hosts had said the petit taxi would be 15 DHS and not more and it was not even a point of discussion with the driver, clearly that was the going price and they were not interested in anymore (or less). 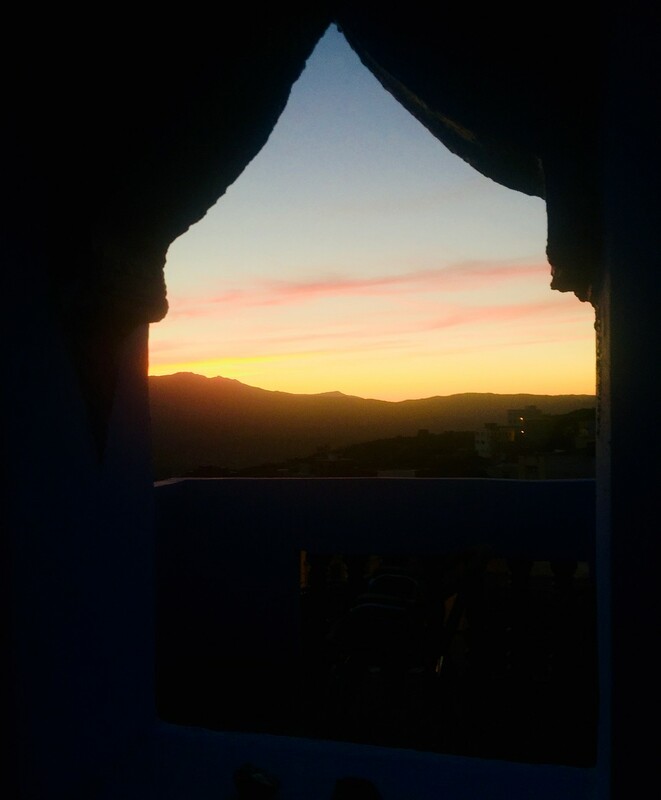 On our return home from exploring the blue streets of Chefchaouen, our wonderful hosts, who seemed to have adopted us as part of the family, had organised dinner: home delivered burgers! The burger, like pizza appears to be an international dish, with every locality introducing their own take on it. If you are in Chaouen (as it is referred to locally) don’t miss this! It is a quality burger, with salad and great dressing, Terry had suggested we also indulge in dessert – a concoction of mashed avocado, milk, sugar and fruit, called Zazzer. Again don’t miss it, although it sounds unusual, it was delicious! We might take this one home to the see if the smashed avocado loving hipster set will take to it!!!!! The Chez Aziz cafe does not have a website but is easily found by google search or simply asking a local for directions. 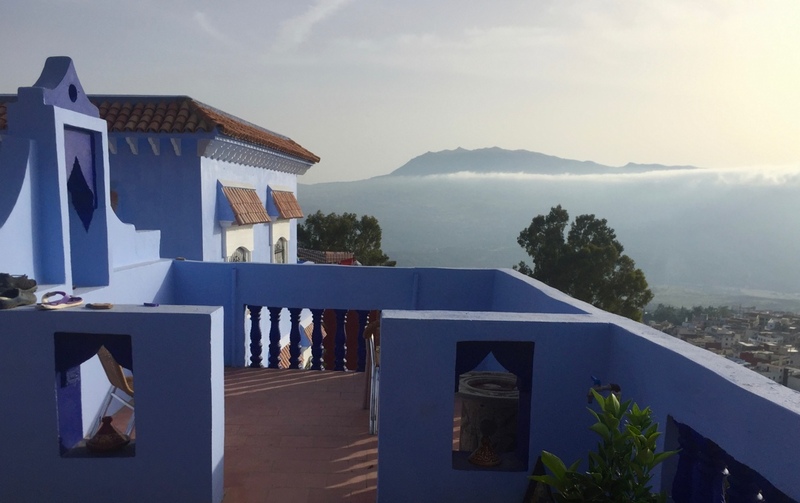 Saturday was our second day in Chefchaouen and it started out slowly, with a long brunch provided by our hosts and more gazing at that incredible view from the terrace. Dar Scotlandee may be budget accomodation by European prices but the breakfast is anything but and neither is the view. After brunch we took the opportunity to explore the medina again as we had to go into the city to get cash and collect tickets for our next bus trip. Saturday was a little busier in the medina, although nothing compared to the frenetic Marrakech; we again just let ourselves be lost and found the most amazing sites, including the Instagram famous street drizzled with white paint, which appears to be running down the blue steps. Truthfully a twenty something American couple asked us for directions to it and we just took up the challenge to find it, funnily enough when we did find it they were arriving too. After wandering for a while we found ourselves at the food market in the newer part of the city and whilst were we tempted by the look of the yummy french looking bakeries we were a but put off by the swarms of what we thought were flies inside the cases. Another tip, they aren’t flies they are bees, wanting to get at the honey and sugar that coats the cakes. 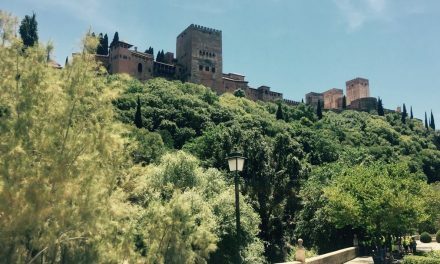 We grabbed a petit taxi which took us all the way down the hill to the CTM bus station, where we purchased our tickets before bidding our taxi driver to take us up to the Atlas Hotel, which sits high above the city on a rocky outcrop. 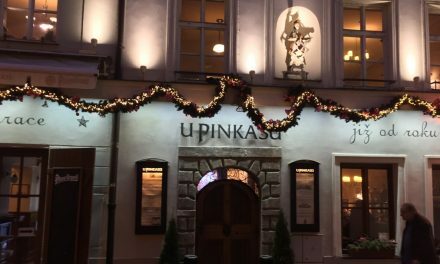 It is a great reference point as it can be seen from everywhere; it is also one of the few places licensed to sell alcoholic drinks. We enjoyed a couple of fabulously cold beers on the balcony, before chancing our arm with the barman to get some take aways. As it turned out, no problem at all, although rather expensive by local standards. He loaded us up with a dozen beers to take back to the B’nB. It proved to be a good move and in no time we were all kicking back, having a lovely party on the terrace watching the sunset over the valley. Terry claimed it was his birthday and took off for more booze, returning half an hour later with ten stubbies and two bottles of red. The last booze to be had in town apparently. Ramadan, the Islamic fasting month, was to start on our last day in Morocco and the bars and restaurants would not stock any more until after the end of the month. Naturally we chipped in and cleared up the evidence relatively quickly. Sunday dawned a little too brightly for some of us who may have had a little too much party the evening before and it was a slower start. Terry had organised a trip over the mountain, where we could admire the view, see how the locals do their thing and also get to observe the acres of marijuana plants. Where else in the world could you do that? Although it ended up costing us 600 Dhs, it proved to be the ride of a lifetime. We were met at the house by the driver and Terry’s acquaintance, Mohammed in a fairly well battered Landrover Defender. Ian has a soft spot for all things Landrover (we have Dizzy the Discovery at home) and was delighted to be travelling in an old model. We were immediately on our way. The dirt tracks from our accommodation were pretty rough…. and things just got more interesting as we climbed. The track up quickly became impassable to all but a four wheel drive or a donkey, with deep ruts, crumbled sidings, small rockfalls and dramatic cliff sides. The view which we admired greatly from 1000 metres, was causing a mixture of fear, wonder and horror in Ian, as we passed up into the 2000 metre range. The hairpin bends became shorter and more numerous and the road became steeper by the minute; by this stage Ian was gripping the seats and staring fixedly forward, while Cath was deliriously happy, hanging out the windows and furiously snapping pictures. Now it clearly takes a courageous and highly competent driver to undertake a journey like this and our driver was no slouch. He was in fact the Joe Cool of the Arab world. Waving his arms, taking his shirt on and off at various stages a’la Michael Jackson, looking out the window at the back instead of the front and ensuring that the tyres got a good grip on the side of the road, rather than the top. Ian had become convinced that they would all guess the knocking sound was coming from his knees, but fortunately the relentless growl of the motor covered everything. As we ascended higher the road began to plateaux and Cath was finally able to prize Ian’s hands from in front of his eyes. It was amazing to see that everywhere possible, people were growing Marijuana, literally on every surface, this is no underground operation. The fields were full of it in various stages of growth and every now and then there would be someone moving a sprinkler or hose. Finally, as we were at last able to relax amid the higher valleys, our guide announced it was time to turn around and travel back down. The smile has never left Ian’s face quicker! We were delighted when our guide announced we were now off to see a local village and the d’Akchour gorge. As it happened the gorge was delightful and the road, which our guide announced proudly was commissioned by the king, was in much better state. The road was built in order for the King to travel from Chefchaouen to the gorge, as do many Moroccan’s on weekend trips and hiking expeditions. The mountains are world renowned for hiking and rock climbing, which is not really our style. A mint tea beside the reservoir was a great restorative before the final journey back to our accommodation. And as a souvenir of our trip, Mohammed handed over a little nugget of the local produce, proud as punch without the blink of an eye and without any idea if we were interested in hashish. Well when in Rome…. 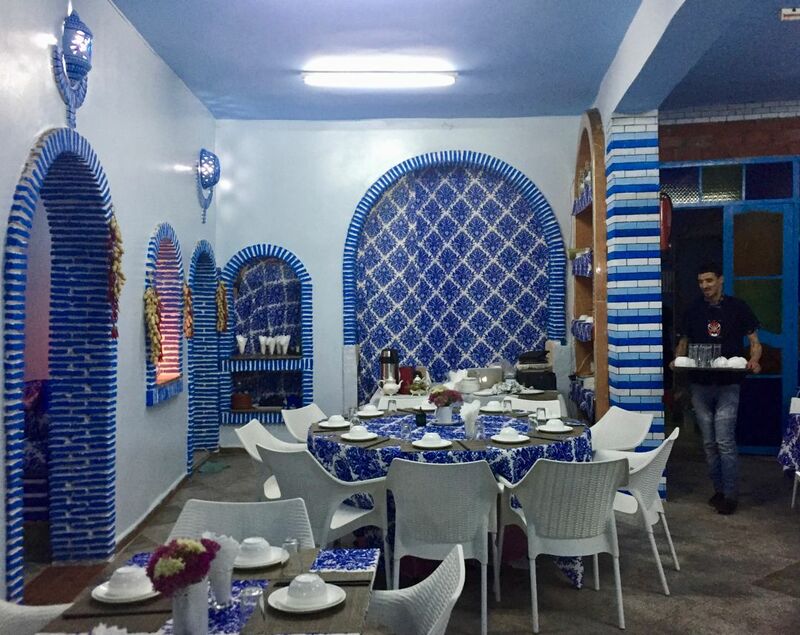 Every town has its own quirks and Chefchaouen, apart from selling burgers had another ace up its sleeve, a new Chinese restaurant, Tiankong Zhicheng. So it was we found ourselves, along with our new friends and AirBnb hosts settling into a Moroccan themed, chinese restaurant. An interesting decor proved to be indicative of an even more interesting meal. In acknowledgement of the Moroccan culture, there was no pork on the menu and the ham in the special fried rice even appeared fake. We had been reminded how the locals weren’t partial to spicy foods, so made a point of asking for spicy and it turned out to be quite good, spicy and there was heaps of it. Our last morning in Chefchaouen was spent rocking the Kasbah, which we had somehow managed to bypass on our previous trips into the city. We remain unsure how we did that as it is the only dark red building in there and there is a massive Australian eucalyptus tree right out the front, which as Aussies we are naturally attracted too! We will have our passports revoked soon, if we don’t pay more attention to the gum trees. The Kasbah is a charming old building of brown adobe that must have been quite impressive in its day and the gardens as always were an oasis of colour, calm and shade. We both resolved to offer to look after it for the king, if needed. It would be a magical boutique hotel. Finally Terry kindly delivered us to the bus for our last journey in Morocco to Tangier and the ferry to Spain. This has been on my wishlist since forever. Seeing your pictures and reading your post only confirms I should start making plans! Such amazing pictures of the city and so much to see and do! This city amazes me and I’m definitely planning a trip here in the future! The medina sounds exciting! Hi Yeshi, thanks for reading and commenting. 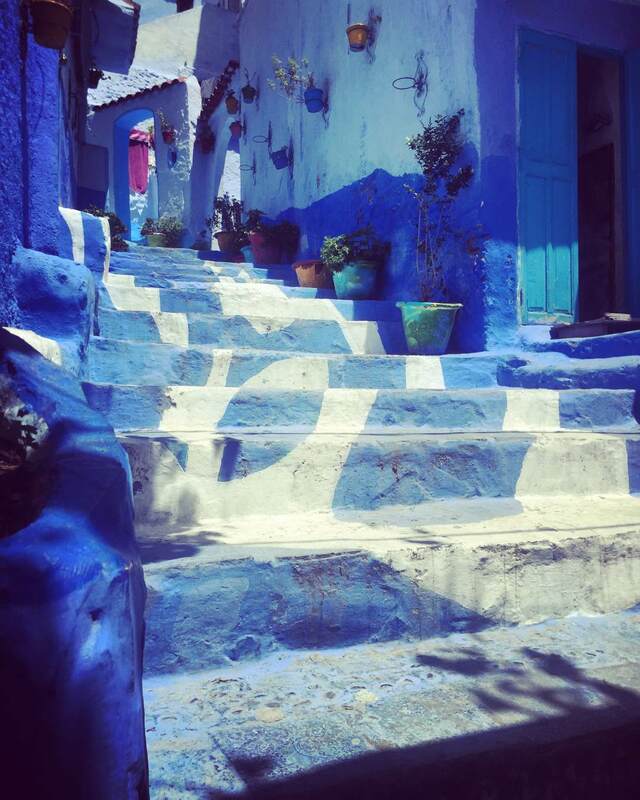 You would love Chefchaouen and it’s pretty medina. I’m so sad we missed seeing the famous blue city when we were in Morocco. It looks as amazing as everyone says it is! I like the sound of your b&b too! Nice tips from the BnB host. It’s always good to hear from the locals staying there. You can get a different kinda of experience. Thank you for sharing! Morocco is such an interesting place. That mint tea sounds good! And so does the zazzer. How was your experience with the hot weather? I have heard that Morocco is a wonderful place to travel. After reading this post, I decided to travel to Morocco next. Will definitely visit Chefchauen. Thanks for sharing. Hi, thank you for commenting. 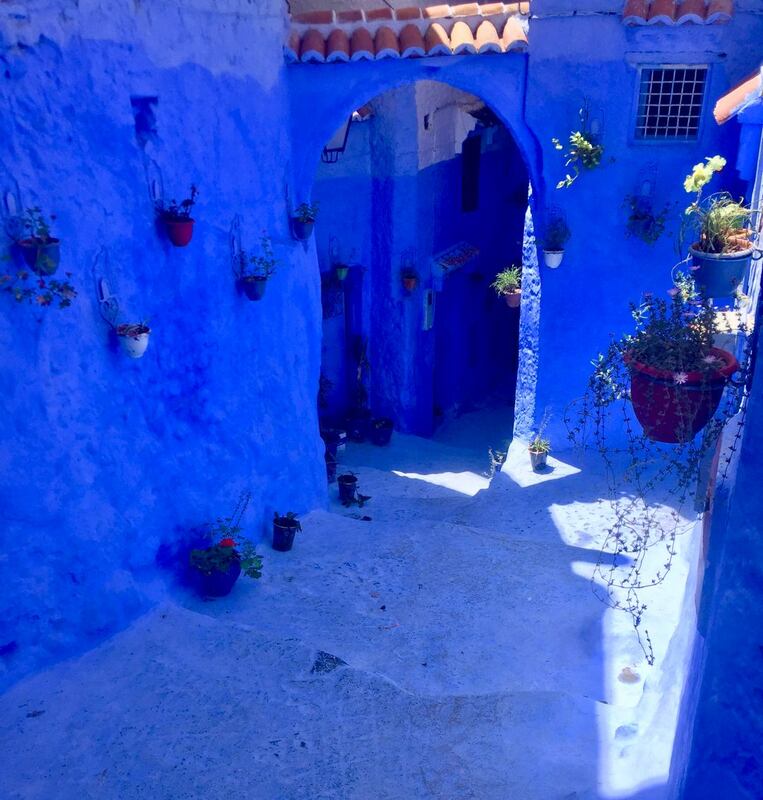 You will just have to have another trip to Morocco to see the Blue Pearl, Chefchaouen, it is a wonderful experience.